Software Advice recently published a report addressing the main concerns companies have when looking to purchase and implement a new CMMS system. Our integration partner Maintenance Assistant CMMS (MA CMMS) has also written blogs and an eBook about this topic, but let’s look at some of Software Advice’s findings as well. Our friends over at MA CMMS have put together a brief summary of their key findings, but we recommend you also take a look at the full case study for more detailed information. There’s a lot of information you need to determine before beginning your CMMS search. Your company should find out what types of functionality it requires the most, determine the budget and what you can expect in terms of your return on investment. These are just a few of many criteria that should be considered before you set out to find the CMMS that’s the best fit for your company. As we all know, when it comes to entering data, ‘garbage in, means garbage out’. When you’re setting up your CMMS it’s critical that the information you’re inputting is organized and clean otherwise you’ll never be able to use your CMMS to it’s full potential. 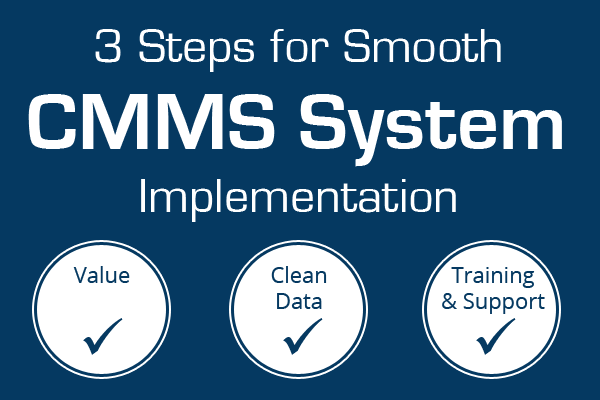 Whether you’re migrating data from an old CMMS system or inputting data right from scratch, it’s important to take your time on this step of your CMMS implementation. Having a dedicated person or team responsible for learning the CMMS system, setting up the correct process and for inputting data is one of the best ways to make sure that your CMMS is set up for success. A CMMS system is only as good as your knowledge of how to use it. Getting set up is only half the battle. The best in class CMMS providers will have a host of training services available to you so that once your CMMS is set up you can make sure your team knows what they’re doing and how to make the most of the new software. For more information on successful CMMS implementation be sure to check out the full article by Software Advice. Or learn more about the CMMS implementation services offered by our customer support team at GoFleet.